1 What is an Ankle Arthroplasty? What is an Ankle Arthroplasty? Ankle replacement surgery has been available for over two decades however it is a far less common procedure than hip or knee arthroplasty owing to the less frequent incidence of osteoarthritis ankle pathology. The majority of ankle osteoarthritis is secondary to trauma. Total ankle replacement was developed in the 1970's but initially was plagued with high long term failure rates. The older prosthesis loosened or malfunctioned and frequently needed to be removed. In the late 70's Dr. Frank G. Alvine an orthopedic surgeon from Sioux Falls, SD developed the Agility Ankle which was the first FDA approved total ankle implant in use in the United States. Since its introduction the Agility Ankle System has gone through several modifications. Currently the Agility Ankle System is the most widely used ankle prosthesis. With more than 20 years of experience it has the longest followup of any fixed bearing device. On May 29, 2009 the medical news today announced the FDA approved the first mobile bearing device called the Scandinavian Total Ankle Replacement System (STAR). As a condition of FDA approval the company (Small Bone Innovations Inc.) must evaluate the safety and effectiveness of the device during the next eight years. In a systematic review of the literature published in the Journal of Bone and Joint Surgery in 2007, the intermediate outcome of total ankle arthroplasty appears to be similiar to that of ankle arthrodesis however data was sparse. In a study comparing reoperation rates following ankle arthrodesis and total ankle arthroplasty SooHoo, Zingmond and Ko confirmed that ankle replacement is associated with a higher risk of complications as compared with ankle fusion, but also has potential advantages in terms of a decreased risk of the patient requiring subtalar joint fusion. In a seven to sixteen year follow up on the Agility Total Ankle Arthroplasty, Knecht, Estin, Callagham et al concluded that the relatively low rates of radiographic hindfoot arthritis and revision procedures at an average of nine years after the arthroplasty are encouraging. Although interest in total ankle replacements is increasing, midterm clinical results to date are few and often have not been validated by independent pratitioners. In addition no level I or II studies have been published. Poor patient satisfaction, high rates of revision due to loosening, and high wound complications rates were all very problematic when total ankle arthroplasty (TAA) surgeries were first introduced in the 1970’s. In 1990, noncemented prostheses were shown to allow for bony ingrowth and less bone removal as compared to cemented. Beyond the transition to cementless, further advances in technology over the years has led to new surgical arthroplasty techniques, primarily moving from a two-component design to a 3-component model. An observational study analyzed advantages of arthroplasty over arthrodesis stating individuals with monoarticular or polyarticular disease who undergo arthroplasty have less gait abnormalities and fewer adverse effects to other joints in the lower extremity. A systematic review provided that in 852 individuals undergoing TAA's, there was a 78% implant survival 5 years post-op and 77% at 10 years post-op and overall only had a 7% revision rate. This provides evidence that the procedure yields satisfactory results and should be considered for potential candidates that are appropriate for surgical corrections. Indications: According to Saltzman, there are no exact indications for receiving a total ankle arthroplasty. The “ideal” patient who would typically undergo this intervention is one who is elderly with a healthy immunity, normal vascular status, good bone density, and a proper hindfoot-ankle alignment who has not had success with conservative treatment measures. Individuals with debilitating ankle arthritis, unresponsive to nonoperative approaches, or have failures with the outcome of their ankle arthroplasty are typically treated with an arthrodesis procedure to fuse the joint. Contraindications: Arthroplasty is contraindicated for those with neuroarthropathic degenerative joint disease, infection, avascular necrosis of the talus, osteochondritis dessicans, malalignment of the hindfoot-ankle, severe benign joint hypermobility syndromes or soft tissue problems, or decreased sensation or motion in the lower extremities. In individuals with rheumatoid arthritis (RA), inflammatory processes may occur before signs of swelling, tissue reaction, and joint destruction are seen. In the first and second year of this disease process, structural damage (ie. joint erosion) can be seen with X-ray imaging. Diabetic patients may develop gouty arthritis in their ankle joint. This is caused by uric acid changing into urate crystals, which is deposited into the joint. Thus, RA and diabetic individuals may or may not be candidates for ankle arthroplasty depending on the severity of joint degeneration found with radiographic imaging. Weight bearing A-P and lateral mortise views of bilateral ankles is required to make effective preparation and anticipation of that will be required in the surgery. The rearfoot alignment (Cobey/Saltzman) view is essential to evaluate the ankle joint and identify any calcaneal-totibial deformities. This is performed by getting the patient to stand, elevated with a cassette positioned at 15 degres anteriorly inclined with the x-ray bemed perpendicular to the film. This position is altered if deformities are present, after this has been taken anterior distal tibial angle (ADTA) is measured. The ADTA is formed by the mechanical axis of the tibia and the joint orientation line of the ankle in the sagittal plane and measures 80° ± 3° in the normal lower extremity. In the coronal plane, the lateral distal tibial angle (LDTA), the tibial-talar angle and the calcaneal tibial alignment should be measured. The LDTA is formed by the distal tibial articular surface and the anatomical axis of the tibia and measures 89° ± 3°.29, if this is decreased this represents a varus deformity. The tibial-talar angle (Figure 3C) is defined by the tibial and talar articular surfaces in the ankle joint. When the tibialtalar angle is >10° the joint is defined as incongruent (unstable). "If an abnormal ADTA or LDTA is present (sagittal or coronal deformity), the center of rotation of angulation (CORA) is measured. The CORA is the intersection of the mid-diaphyseal line and the line starting from the middle of the joint and perpendicular to the abnormal ADTA or LDTA (Figure 4). The CORA can be located at the joint line level (usually due to anatomical joint line malalignment or to ankle degeneration) or proximally (usually due to tibial deformities/fractures)". So as you can see there are many consideration to be taken, and multiple angles to be analysed and this is important and any instability and malalignment of the new prosthesis can be excessively worn or may even fail. Early ankle prosthesis attempts involved cementing a stemmed metal ball into the tibia and a polyethylene cup cemented into the talus. Throughout the 1970’s, prosthesis evolved into using a vitallium component cemented into the talus. All designs used methylmethacrylate cement, which became the defining element of first generation prosthesis. Constrained - Increased stability due to only allowing dorsiflexion and plantarflexion. Loosening of the prosthesis was common from increased torque at the joint. Nonconstrained - Allows full ROM, resulting in decreased stability that commonly caused impingement against the medial and/or lateral malleoli. Semiconstrained - A combination of contrained and nonconstrained models, allowing greater ROM and medial-lateral stability. The Imperial College, London Hospital prosthesis uses a concave polyethylene in the tibia and a stainless steel component on the talus. Unfortunately, by the early 1980’s, first generation ankle arthroplasties were not recommended by the majority of orthaepedic surgeons. Numerous studies showed loosening of the cement fixation, wound issues, and low patient satisfaction . As a result of the poor outcomes and high complication rate, surgeons began to recommended ankle arthrodesis. Second generation arthroplasties are cementless, using bony ingrowth to stabilize the implant. Compared to cement, bony ingrowth prosthesis have less bone resection, damage to soft tissue and complications of the cement such as cement displacement. Fixation: Ingrowth implants tend to have either a beaded surface along the bony interface, hydroxyapatite layer or a combination of both. Current surgical designs tend to use the combination fixation technique. Between types of prosthesis the number of articulating surfaces and components both need to be considered..
Articulating surfaces: Current designs vary on the articulations that need to be resurfaced. Resurfacing may occur at the superior tibiotalar joint, superior and medial articulations, or medial, lateral, and superior joints. Determining which patients would benefit the most from each type of surgery is ongoing. Disadvantages: increased bony resection, likelihood of soft tissue compromise, accelerated polyethylene wear, and possibility of syndesmosis fusion failure. Both component designs permit semiconstrained motion, specifically allowing some inversion and eversion during sagittal plane ankle movement. The four 2 component designs have been approved by the U.S. Food and Drug Administration (FDA). The STAR was recommended for approval by the FDA in 2008. There is insufficient evidence determining the life expectancy of current prosthesis designs. To perfrom the procedure the patient is positioned supine with the hip slightly elevated and a tourniquet on the proximal thigh to restrict blood flow during the procedure. Next a 10 cm incision is made over the centre of the joint line to expose the relevent anatomical structures. Once the structures have been exposed the crucial nerves and tendons are identified as to protect and ensure their integrity to minimise operative complications, these include; peroneal nerves, tibialis anterior and extensor hallucis longus. This is also to achieve correct talocrural alignment and soft tissue balance to ensure the prosthesis can achieve plantar grade in standing. It is also important to debride and correct any osteophytes or any other structures that can contribute to malalignment. Depending on the natural angle of the talocrural joint (varus or valgus) more bone medially or laterally may have ot be removed, this also may occur if the joint is deep or shallow as it may need to be reduced or elevated. Once the joints have been corrected and bones properly aligned the new components are trialed making sure rull ROM and stability is achieved. If dorsiflexion is limited and not due to malalignment then achilles tendon lengthening is required, the same goes for if there is instability in inversion or eversion the ligaments are reconstructed. Persistent malalignment can occure and may need separate procedures to correct such as subtalar fusion depending on severity and correctability. Ankle arthrodesis or fusion was the recommended surgical option after the failure of the first generation ankle arthroplasty. The procedure includes resecting the articular surfaces of the joint, realignment the talus and tibia and fusing the bones together. As a result, the ankle joint doesn’t allow any motion. The goal of ankle arthrodesis is pain relief. Unfortunately, the lack of ankle motion can cause elevated stress on the knee and hindfoot and in addition, increases motion at the hindfoot that may become arthritic. Other complications of fusion include accelerated degeneration of adjacent joint and limitations in activity. As it will be explained in the pre-operation and post-operation phase the multi-disciplinary team involved with the patient have a big role in making the arrangements before and after the surgery, this may involve physiotherapists, occupational therapists, discharge nurses, staff nurses, healthcare assistants as well as doctors. Both pre and post operative phases are integral to the progress of the patient and the pre-op should not be overlooked as important as it can be easy to focus on post-op. As will all procedures under general anesthetic there are common pulmonary postoperative complications (PPC's) which need to be controlled and risk reduced and this can be explained at this stage as well. It is important to ensure the risk of PPC's are reduced and respiratory physiotherapy may be used at this early stage, cough, deep breathing exercises and early mobility are essential here to reduce atelectasis and reinstate the muscoscilliary elevator as soon as possible. As can be expected after any type of surgery, pain and inflammation must be controlled. This is the case especially after ankle replacement because pain and inflammation can last up to 12 months after surgery. Surrounding muscles can be damaged during surgery and can result in decreased range of motion and strength. Damage to joint proprioceptors during excision of the capsule may cause deficits in both static and dynamic balance. These components can lead to gait disability and decreased efficiency of locomotion. Correction of gait posture and ambulation deficiencies will be a target of therapy once the patient is ambulating independently. Here is a unfinished list of some of the major muscles of the lower leg and foot, consider these in your rehabilitation and mechanism of pathology. Some may have had tendons moved or stretched and now need to be specifically rehabilitated as the proprioceptive function may now have changed. After the surgery it is important that the patient keeps moving and performing his daily activities. However there is still discussion between physicians about when the patient should start again with exercising. There are some that allow exercise immediately after surgery. But some say it is considered best to wait until there is a satisfactory bony in growth as shown radio graphically. However it’s the job of the physician to try to improve: the patient’s ROM of the ankle, maintain the ROM in the hip and knee, increase the muscle strength with exercise for the Gluteus Maximus, Quadriceps femoris muscles and the muscles that are responsible for dorsal flexion and the plantar flexion of the ankle. Postoperative mobilization begins early, with rapid progression to resumption of normal activities. The goal is to obtain 10° of dorsal flexion and 30° of plantar flexion. For patients who have almost no motion in their ankle is any motion an improvement. In early postoperative period it is important that the incision heals and the implant becomes solidly fixed to the bony bed to do this they will use a below knee non-weight bearing immobilization. This is maintained until there is satisfactory bony in growth. . Another goal is to increase the ROM of the ankle and maintain the hip and the knee ROM. After a few months the patient needs to make an appointment with the doctor. Here they will take X-ray scans to see if there are no complications like: joint debridement for osseous impingement; the next most common procedures were extra-articular procedures for axial misalignments and component replacements. Outcome of ankle arthroplasty includes pain, function implant survival and complications. There are numerous studies looking at survival rate of implants and rates are reported around 67-94% at 5 years and 75% at ten years which is reasonably reliable. A systematic review of intermediate and long term outcomes of arthrolplasty and arthrodesis performed by Haddal et al had interesting results. It reviewed 49 primary studies of 1262 patients and utilised the AOFAS score (Americal Orthopaedic Foot and Ankle Society). This score is out of 100 (0=worst outcome, 100=best outcome) broken into 8 sections of pain, function walking distance, walking surface, gait abnormality, sagittal mobility, hindfoot mobility, ankle hindfoot mobility and alignment. The score has mixed reviews and the objective aspect of the score is hard to make reliable between therapists. "the intermediate outcome of total ankle arthroplasty appears to be similar to that of ankle arthrodesis; however, data were sparse. Comparative studies are needed to strengthen this conclusion". 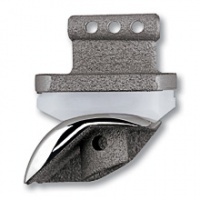 ↑ Cerrato R, Myerson MS. Total Ankle Replacement:the Agility LP prosthesis. Foot and Ankle Clin. 2008 Sept; 13(3): 485-94. ↑ Haddad SL, Coetzee JC, Estok R. et al. Intermediate and Long-Term Outcomes of Total Ankle Arthroplasy and Ankle Arthrodesis. The Journal of Bone and Joint Surgery (American). 2007;89:1899-1905. ↑ SooHoo NF, Zingmond DS, Ko CY. Comparison of Reoperation Rates Following Ankle Arthrodesis and Total Ankle Arthroplasty. The Journal of Bone and Joint Surgery (American). 2007;89:2143-2149. ↑ Knecht SI, Estin M, Callaghan JJ et al. The Agility Total Ankle Arthroplasty: Seven to Sixteen-Year Follow-up. The Journal of Bone and Joint Surgery (American). 2004;86:1161-1171. ↑ Cracchiolo A 3rd, Deorio JK. Design features of current total ankle replacements: implants and instrumentation. Journal of the American Academy of Orthopedic Surgeons. 2008 Sept:16(9):530-40. ↑ 11.00 11.01 11.02 11.03 11.04 11.05 11.06 11.07 11.08 11.09 11.10 11.11 11.12 Cook R.A., O’Malley M.J. Total Ankle Arthroplasty. Orthop Nurs. 2001;20(4): 30-37. ↑ Doets, C., Brand, R., Nelissen, R. Total Ankle Arthroplasty in Inflammatory Joint Disease with Use of Two Mobile-Bearing Designs. The Journal of Bone and Joint Surgery. 2006;88:1274-1284. ↑ Haddad, S. et all. Arthroplasty vs Arthrodesis: Intermediate and Long-Term Outcomes of Total Ankle Arthroplasty and Ankle Arthrodesis A Systematic Review of the Literature. The Journal of Bone and Joint Surgery. 2007;89:1899-1905. ↑ 17.0 17.1 17.2 17.3 17.4 17.5 17.6 17.7 17.8 17.9 Saltzman, C.L., McIff, T.E., Buckwalter, J.A., Brown, T.D. Total Ankle Replacement Revisited. JOSPT. 2000;30: 56-67. ↑ 18.0 18.1 Goodman, C., Snyder, T. Differential Diagnosis for Physical Therapists: Screening for Referral. 4th ed. St. Louis: Saunders Elsevier, 2009. ↑ 20.0 20.1 Gill. LH. Challenges in Total Ankle Arthroplasty. Foot Ankle Int. 2004;25(4):195-207. ↑ 21.0 21.1 21.2 21.3 21.4 Guyer, A.J., Richardson, E.G. Current Concepts Review: Total Ankle Arthroplasty. Foot Ankle Int. 2008;29(2): 256-264. ↑ Cracchiolo A. III, Deorio, J.K. Design features of current total ankle replacements: implants and instrumentation. J Am Acad Orthop Surg. 2008;16(9):530-540. 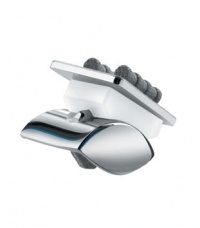 ↑ Pfeiff C. The Scandinavian Total Ankle Replacement (STAR). Orthop Nurs. 2006; 25(1): 30-33. ↑ Lagaay PM, Schuberth JM. Analysis of Ankle Range of Motion and Functional Outcome Following Total Ankle Arthoplasty. The Journal of Foot and Ankle Surgery. 2010: Iss. 49, 147-151. ↑ Gougoulias N, Khanna A, Maffulli N. How Successful are Current Ankle Replacements? : A Systematic Review of the Literature. Clinical Orthopaedics and Related Research. Clin Orthop Relat Res. Jan 2010: 199-208. ↑ Buechel FF Sr, Buechel FF Jr, Pappas MJ. Twenty- year evaluation of cementless mobile-bearing total ankle replacements. Department of Orthopaedic Surgery New Jersey Medical School. Jul 2004: 19-26. ↑ Bonnin M, Judet T, Colombier JA, Buscayret JA, Graveleau N, Piriou P. Midterm results of the Salto Total Ankle Prosthesis. Clin Orthop Relat Res. Jul 2004: 6-18. ↑ 41.0 41.1 Lee KB, Park YH, Song EK, Yoon TR, Jung KI. Static and dynamic postural balance after successful mobile-bearing total ankle arthroplasty. Arch Phys Med Rehabil. Apr 2010: 519-522. ↑ Culham EG, Westlake KP, Wu Y. Sensory-specific balance training in older adults: effect on position, movement, and velocity sense at the ankle. Phys Ther. May 2007: 560-568. ↑ Detrembleur C. Leemrijse T. The effects of total ankle replacement on gait disability: analysis of energetic and mechanical variables. Gait Posture. Feb 2009. 270-274. ↑ 44.0 44.1 44.2 C. Nüesch, V. Valderrabano, C. Huber, V. von Tscharner, and G. Pagenstert, “Gait patterns of asymmetric ankle osteoarthritis patients,” Clin. Biomech., vol. 27, no. 6, pp. 613–618, 2012. ↑ Valderrabano V., Nigg B.M., von Tscharner V., Frank C.B., Hintermann B. Total ankle replacement in ankle osteoarthritis: an analysis of muscle rehabilitation. Foot Ankle Int. 2007;28(2):281-291. ↑ Dyrby C., Chou L.B., Andriacchi T.P., Mann R.A. Functional evaluation of the Scandinavian Total Ankle Replacement. Foot Ankle Int.2004;25(6):377-381. ↑ SMITH C.L., L.T., M.S.C., U.S.N., ‘Physical therapy management of patients with total ankle replacement’, Physical Therapy, 1980, March, vol. 60, nr. 8, p. 303-306. ↑ Gougoulias, Nikolaos; Khanna, Anil; Maffulli, Nicola (2009). "How Successful are Current Ankle Replacements? All though most total ankle replacement are successful by reducing pain and improving mobility there is a very high possibility that the pain may be ten times worse. There have been several cases where the doctors have recommended amputation to resolve the issue of pain that was not there prior to the total ankle replacement. : A Systematic Review of the Literature". Clinical Orthopaedics and Related Research 468: 199–208. ↑ 56.0 56.1 Haddad SL, Coetzee JC, Estok R, Fahrbach K, Banel D, Nalysnyk L. Intermediate and long-term outcomes of total ankle arthroplasty and ankle arthrodesis. A systematic review of the literature. J Bone Joint Surg Am. 2007 Sep;89(9):1899-905.